Freedom Summer was the nonviolent effort by civil rights activists to integrate Mississippi's segregated political system during 1964. Volunteers were recruited and trained to help Mississippi's African-American residents register to vote, establish a new political party and learn about history and politics in newly-formed Freedom Schools. Prior to the Freedom Summer Project, civil rights activists had met fierce violence as they tried to integrate Mississippi's political institutions. 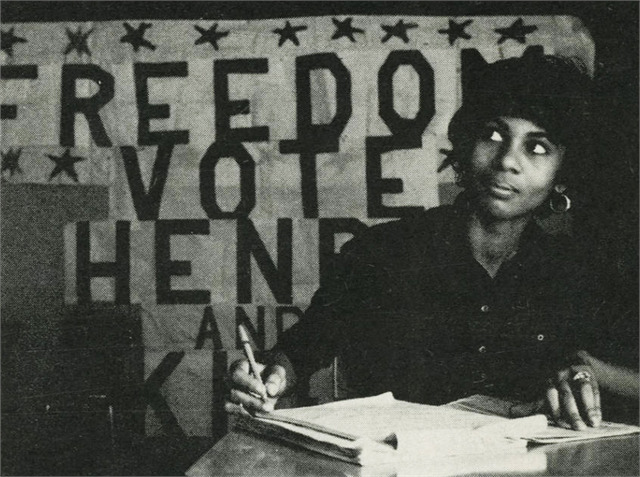 In the fall of 1963, the Student Nonviolent Coordinating Committee (SNCC) helped local organizers stage an unofficial "Freedom Vote" that proved black Mississippians wanted to participate in the electoral process. 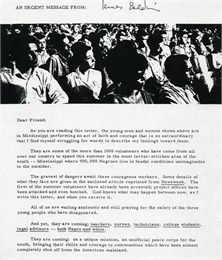 Planning for Freedom Summer began late in 1963 when the Student Nonviolent Coordinating Committee (SNCC), the Council of Federated Organizations (COFO) and the Congress of Racial Equality (CORE) decided to recruit several hundred northern volunteers, mostly white college students, to work in Mississippi. During Freedom Summer black Mississippians and volunteers were met by extraordinary violence, including murders, bombings, kidnappings, and torture. 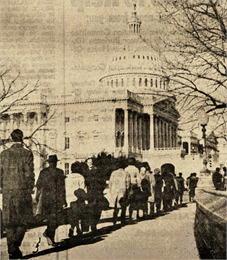 These events were covered on national television, and public outrage helped spur the U.S. Congress to pass the Civil Rights Act of 1964 and the Voting Rights Act of 1965. Click on a date below to view an original document from the Freedom Summer Digital Collection. 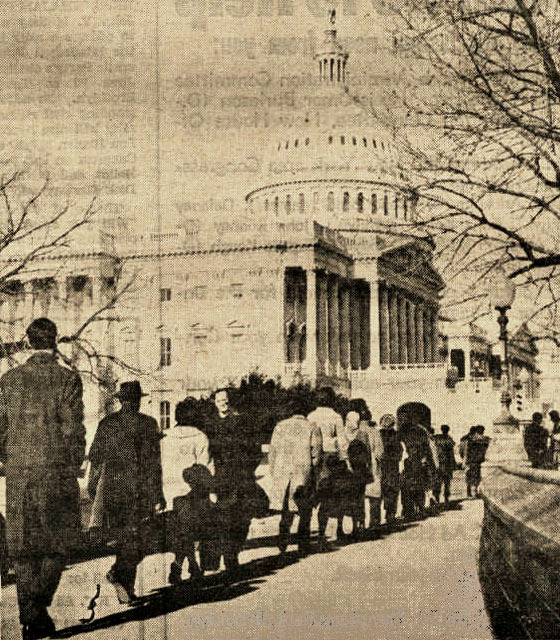 Aug 28 - The March on Washington - Officially named "March on Washington for Jobs and Freedom," this mass demonstration draws 250,000 people. Martin Luther King delivers his "I Have a Dream" speech. SNCC's chairperson John Lewis criticizes the federal government for failing to protect the civil rights of Mississippi residents. 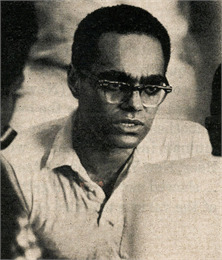 Sep - Mississippi Voter Registration Project Proposed - Bob Moses, director of SNCC, proposes a Mississippi voter registration project to the SNCC executive committee to consider at its September 6-9, 1963. This is the genesis of Freedom Summer. 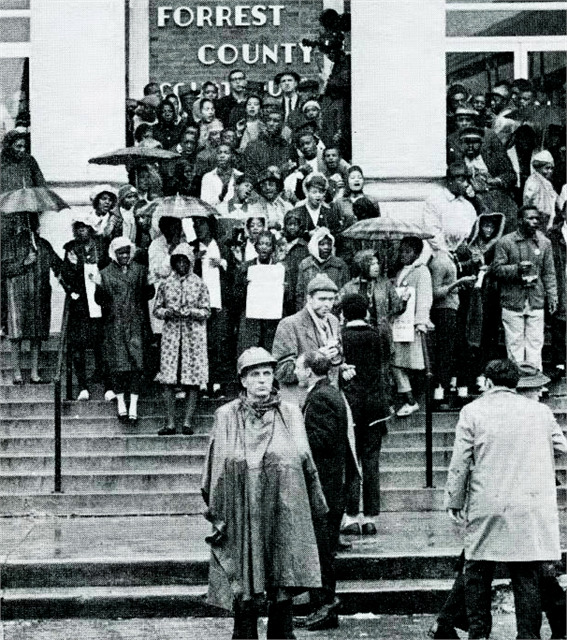 Sep 6 - Atlanta SNCC Meeting - During this four-day meeting, SNCC debates Moses' idea to focus on Mississippi voter registration rather than conducting direct actions such as sit-ins and boycotts. Nov 4 - 'Freedom Vote' 1963 - More than 80,000 people participate in mock elections to disprove the white claim that Africa-Americans didn't want to vote. Several dozen white volunteers from Stanford and Yale universities came to help. Press coverage of their effort sparks the idea that using white volunteers might focus the nation's attention on the injustice in Mississippi. Nov 11 - Greenville SNCC Meeting - At this four-day staff meeting in Greenville, Mississippi, SNCC debates bringing 1,000 northern students to Mississippi the next summer. Many staff are opposed, fearing that it will undermine local black leadership. No decision is made. Dec 15 - Jackson COFO Meeting - At this meeting in Jackson, Mississippi, COFO appoints Bob Moses its project director for voter registration and Dave Dennis assistant program director. Dec 31 - SNCC Executive Committee Meeting - Leaders finally endorse a Mississippi Summer Project for 1964 that includes large numbers of northern white volunteers. Jan 16 - COFO Proposes Challenge at the Democratic National Convention - A COFO subcommittee proposes challenging the right of any all-white delegation to represent Mississippi at the Democratic National Convention (DNC) to be held in Atlantic City, New Jersey, in August 1964. 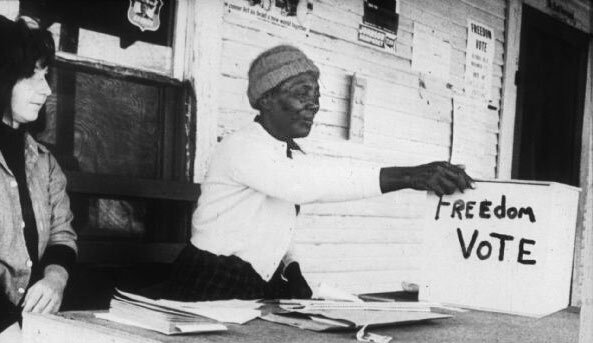 Jan 22 - Hattiesburg 'Freedom Day' - COFO helps 150 black residents of Hattiesburg, Mississippi, attempt to register to vote on 'Freedom Day.' Clergy from around the country assemble to support them. Jan 31 - Activist Louis Allen Murdered - Local NAACP organizer Louis Allen of Liberty, Mississippi, is shot and killed for his support of voter registration efforts. This tips the scales for undecided COFO leaders, who agree to go ahead with the Freedom Summer Project. Feb 9 - Freedom Summer Project Authorized - COFO formally authorizes the Freedom Summer Project. They hope a large influx of well-connected volunteers will focus the country's attention on Mississippi and force the federal government to pass voting rights legislation. Feb 28 - Canton 'Freedom Day' - In Canton, Mississippi, COFO helps more than 300 black residents line up at the county courthouse to register to vote. Though there is no violence, they are guarded by police with shotguns and tear gas. It is the state's largest voter registration attempt up to that time. Feb - Freedom Summer Project Brochure Circulated - SNCC describes the Freedom Summer Project to supporters in an 8-page fund-raising brochure. Mar 21 - Freedom School Planning Conference - The National Council of Churches hosts a Freedom School planning conference in New York City. Mar 30 - Freedom Summer Project Announced - COFO officially launches the project in a one-page press release. Mar-Apr- Freedom Summer Project Recruits Volunteers - Volunteers are invited to apply to work in Mississippi during the project. Mar-Apr- Freedom Summer Project Enlists Local Help - COFO appeals to local black residents for help hosting and supporting volunteers. Mar-Apr- Freedom Summer Project Locations Assigned - Project locations are decided, with staff and volunteers tentatively assigned to each site. Apr - Mississippi Legislature Enacts Restrictions - New laws are passed that restrict picketing and leafleting and expand police authority to intervene. Apr 12 - Black Candidates Nominated - COFO announces black candidates will enter the Mississippi Democratic Party nominating process and, knowing they'll be excluded, also run in a parallel 'Freedom Vote' in November. Apr 14 - Volunteers Interviewed - Interviewers are told what to look for in northern volunteers who want to come to Mississippi to help with voter registration or teach in Freedom Schools. Apr 26 - Mississippi Freedom Democratic Party Established - The party is formally established at a convention held in Jackson, Mississippi. May - Blacks Barred from Local Democratic Party Meetings - As expected, black residents are barred from participating in the Mississippi Democratic Party's local meetings to choose candidates and convention delegates. They hold parallel Mississippi Freedom Democratic Party (MFDP) meetings and choose their own. May 5 - Freedom Summer Project Volunteers Confirmed - Applicants receive acceptance letters and are informed on how to prepare for their roles in Freedom Summer. Jun 14 - Volunteer Training Begins - Volunteers begin to receive training at Western College for Women in Oxford, Ohio, sponsored by the National Council of Churches. The first group attends workshops until June 20. A second session runs June 21-28. Jun 21 - James Chaney, Andrew Goodman and Mickey Schwerner Disappear - Three project workers who left the Ohio training a day early — James Chaney, Andrew Goodman and Mickey Schwerner — are reported missing. They had gone to Longdale, Mississippi, to investigate the bombing of Mt. Zion Church, which had offered to host a Freedom School. They were arrested in Philadelphia, Mississippi, on their way back to the COFO office in Meridian, and were never heard from again. Mississippi. Image from a voter registration brochure created for the Council of Federated Organizations (COFO). Source: Bryan R. Dunlap Papers, 1964-1972, 1994. Jun 29 - Freedom Summer Project Begins - Roughly 500 volunteers and staff are at work in 25 locations around the state. Late Jun - Residents and Volunteers Continue to Face Violence - More than 40 incidents of harassment and violence occur around the state during the last two weeks in June. 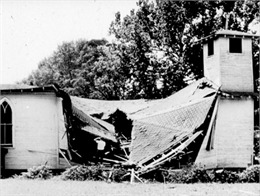 By July 1, 1964, Mississippi has had five bombings, four murders, and numerous shootings of civil rights workers. Jul 2 - First Freedom Schools Open - The first Freedom Schools open in the Mississippi cities of Clarksdale, Holly Springs, and Vicksburg. 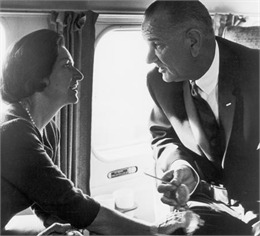 Jul 2 - Civil Rights Act of 1964 Signed - President Lyndon Johnson signs the Civil Rights Act of 1964. It outlaws major forms of discrimination such as segregated facilities or voting laws but provides weak enforcement powers to the federal government. Jul 22 - Martin Luther King Visits - Martin Luther King visits the Mississippi cities of Jackson and Vicksburg to show his support for the Freedom Summer Project. Aug 4 - Murdered Volunteers Bodies Found - The bodies of Chaney, Goodman, and Schwerner are found buried in an earthen dam on a farm outside Philadelphia, Mississippi. Local police had released the three young men to the Ku Klux Klan, who tortured and murdered them before burning their car and hiding their bodies. Aug 6 - Mississippi Freedom Democratic Party (MFDP) Elects Delegates - The MFDP's state convention in Jackson, Mississippi, elects delegates to attend the Democratic National Convention (DNC) to be held in Atlantic City, New Jersey, in August 1964. They hope to unseat the all-white delegation sent by the mainstream Mississippi Democratic Party. Aug 8 - Freedom School Convention - A statewide Freedom School convention is held in Meridian, Mississippi. Students from around the state review the summer's accomplishments and draft resolutions. Aug 22 - Democratic National Convention Held - In Atlantic City, New Jersey, delegates from the Mississippi Democratic Freedom Party challenge the right of delegates from the segregated mainstream Mississippi Democratic Party to represent the state. Their testimony about conditions in Mississippi is broadcast on national television and hundreds of supporters demonstrate outside the convention hall. Democratic National Convention (DNC) officials reject their challenge and they are not seated. Aug-Sep - McComb Violence - In McComb, Mississippi, nine black homes, churches, and businesses are fire bombed over the course of three weeks. 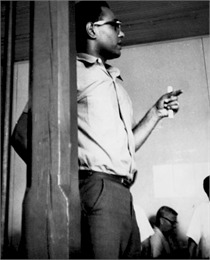 Sep - Freedom Summer Project Leaders Travel to Africa - Entertainer and civil rights supporter Harry Belafonte takes exhausted Freedom Summer leaders to Africa. For some of the Africans, it is the first time they see black people in leadership positions in government and the professions. The trip helps the project leaders connect their work to the struggles of the African black liberation movement and energizes them for further work upon their return to the United States. 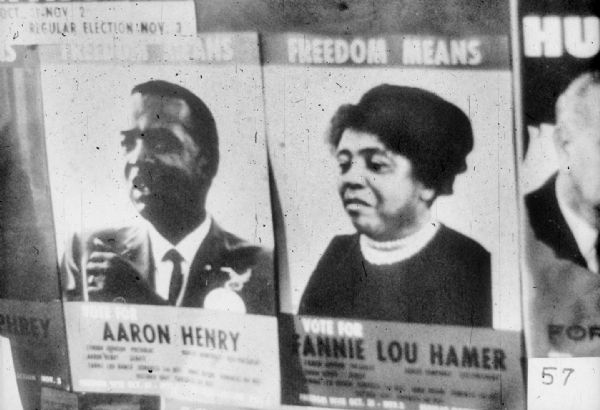 Oct 31 - 'Freedom Vote' Held - Because most black Mississippians have not been allowed to vote in the official election, Freedom Summer Project leaders organize the 1964 'Freedom Vote.' This parallel election is held from October 31 through November 2, 1964, during which more than 68,000 people cast their votes. This proves to political leaders that African-Americans will be an important constituency to address after the barriers to their participation have fallen. Nov 3 - Official Election Held - Lyndon B. Johnson is re-elected President of the United States and white supremacists win Mississippi's five congressional seats. Dec 4 - Mississippi Congressmen Challenged - MFDP challenges the right of the five white congressional representatives elected in November to take their seats, on the grounds that blacks were systematically excluded from voting. After nine months of legal and political wrangling, the U.S. House of Representatives rejects the challenge in September 1965. Jan 16 - FBI Indicts Murder Suspects - The FBI indicts 18 suspects in the murders of Chaney, Goodman and Schwerner. Local officials immediately drop all charges but, under federal pressure, the men are re-charged the next month. Seven are found guilty when legal proceedings end in 1967. Aug 6 - Voting Rights Act of 1965 Signed Into Law - President Johnson signs the Voting Rights Act into law with Martin Luther King, Jr., Rosa Parks, and other civil rights leaders in attendance. It not only prohibits discriminatory registration provisions but also empowers the federal government to send its own registrars to local courthouses to make sure the law is obeyed.